Jell-O Vanilla Cooked Pudding and Pie Filling provides a quick and delicious short cut to traditional kheer. Pour milk into medium saucepan. Stir in pudding mix. Add apples and 2 Tbsp. trail mix; stir. Bring to boil on medium heat, stirring constantly. Cool 5 min. ; stir in cardamom. Refrigerate 2 hours or until chilled. Top with remaining trail mix just before serving. 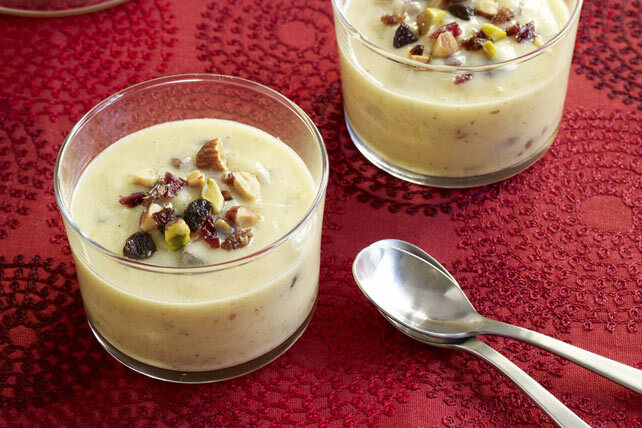 For a change of pace, serve kheer warm instead of chilling it first. Substitute chopped peeled fresh pears for the apples. Or for a mixed fruit dessert, prepare using 1 apple and 1 pear.